My interest with golden and early silver age comics has been growing more and more lately. Certainly I have been checking out Jack Kirby's massive volume of work from the 40s through the 70s. 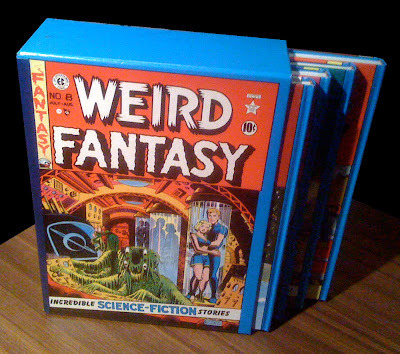 But it is the golden age of EC Comics (from 1950-1955) that have most firmly grabbed my interest. And my interest has been growing to the point of obsession lately. 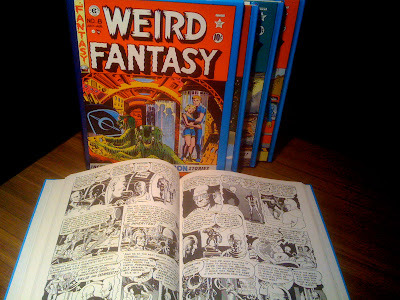 A sizeable part line of EC Comics line has recently been re-released as a line of Deluxe oversize hardcovers printed full colour on thick glossy paper. Sounds great, right? Wrong! These recently re-released volumes feature the stories re-coloured – and badly at that. The colouring of these new volumes is supposed to faithfully reflect the printing of the originals, but the originals were printed on newsprint on old, outdated presses, and the colours have a cool halftone effect. But with the new editions the thick glossy paper its printed on just amplifies the garish nature of the colouring. In short – for me – it just ruins the art. Which is the very reason I'm interested in EC to begin with. An aside - The desire to see comics in black and white is another thing i am preferring more and more lately. Particularly older comics. Steve Ditko never looked as good as he does in black and white. But its more than that – i like seeing an artist who can make a black and white drawing look complete on its own, unlike a lot of colour comics today that look boring when not coloured. I decided that if I have to read them in colour, I want it to be the original colours, on cheap crappy newsprint, just like the originals. I was able to find a small smatting of them at Evil Empire Comics, and then a big stash of them at Collectors Edge in Moonee Ponds (its a great comic shop, well worth the trek out to Moonee Ponds). But even that wasn't enough. I wanted to see these comics in glorious black and white, as large as possible. I had to do a bit of hunting around to find out IF there were any B&W printings – which there were thanks to Phil from Evil Empire Comics shop. But they are not easy to get. I turned to abebooks.com to find some, and discovered there was a retailer here in Melbourne that had a four-volume oversize hardcover slipcase set reproductions of the entire run of Weird Fantasy in glorious black and white. So I went for a trip out to Camberwell and picked up a hefty (in weight and pricetag) four volume hardcover books (with slipcase!) representing the entire run of EC's Wierd Fantasy comics series. Now that i have these, i want more, luckily Fantagraphics are starting a series reprinting old EC comics in B&W hardcovers, focusing on one artist per volume.